Tesla sure has talked big about an electric pickup truck that's supposedly in development. Well, it looks like rival Rivian has something to say, but more importantly something to show. It's their R1T electric truck that just debuted at this year's L.A. Auto Show. It's huge news in the world of trucks and EVs since it combines the best of both worlds. The R1T just happens to look pretty awesome thanks to a conventional pickup truck shape but with futuristic sculpting that sets it apart from every conventional truck out there. Details like a solid front end and truly unique pill-shaped LED headlights give the R1T a look like nothing else on the road. Green means "Go!" thanks to the LED light bar charging indicator up front. There's also an LED light bar that spans the full width of the front end and turns green when it's plugged in for charging. While driving, it's a soft but bright white. There's also a full-width red taillight across the back of the tailgate that matches the front. Who says water and electricity don't mix. The R1T gets properly dirty. The range of the R1T is an amazing 400+ miles from its 180 kWh battery pack. That's 80 kWh more than the Tesla Model X that only gets 289 miles on a single charge. Talk about showing up the other guy. The performance is also staggering, rocketing to 60 mph in three seconds. Folks, that's faster than a Porsche 911T by over half a second. And you can't haul lumber in a 911. Oh, and did we mention that the R1T can tow 11,000 pounds? Yep. What's more, the R1T is also off-road capable, so it walks the talk. There are functional skid plates in front and back, and there's something Rivian calls a "skateboard" platform that underpins the R1T. Their electric-vehicle-specific chassis will be the basis for all of their future vehicles, including an upcoming SUV. The chassis uses high-strength steel and aluminum for lightness and rigidity. The R1T ain't just some show truck. The R1T can control torque at each wheel independently, making for excellent off-road traction, as well as on-road, and it also has an air suspension at all four corners that can actually raise the truck over five inches from its standard ride height. And because there's no air intake because of its electric nature, it can wade into a meter of water. Rivian paid just as much attention to the interior as it did to the exterior design and the truck's capability. It looks nothing like any truck on the market today (and pretty much different from any passenger car, as well). It's not only futuristic with its two huge screens but opulent, as well. Dash, HVAC vent, and center console design are truly special. Rivian even paid attention to the ease of cleaning for all surfaces. They Doors, dash, seats, and floor carpet are stain resistant and can be wiped down easily. The storage capability in the R1T also happens to be unrivaled and unique thanks to its electric nature and battery storage low in the vehicle. There's the truck bed, the large front trunk, and a nifty tunnel that extends the full width of the truck. The doors that open for that space can also be used for steps to unload items from the roof or bed. Hell, you can even sit on them. Inside the bed, there's a port for an air compressor hose that pulls air from the suspension. You can operate power tools or even inflate your tires with it. Ingenious, really. There are also ample USB and USB Type-C ports, even some in the headrests for the rear passengers to easily access. There are even four in the bed and a 110V outlet. You can plug in a fridge, microwave, electric stove, you name it. It's really the first vehicle of its kind to exploit its EV nature this well. This storage section in front of the rear wheel is brilliant. No passengers, please. The R1T will apparently be Level 3 autonomous tech-ready. What this means is hands-free driving, according to Rivian. That's a big step from today's technology, and the promise that this tech will be ready by the truck's launch in 2020 is a stretch. If they can pull it off, that will be something else. In terms of range and pricing, there will be different battery sizes: 180 kWh (400+ miles), 135 kWh (300 miles) and 105 kWh (230 miles). The most expensive version will start around $90,000, and the cheapest will run about $70,000. The level of tech, power, and versatility in the R1T should make it truly attractive to those who want something different in a pickup truck, and we're excited to see this new brand enter the fray. 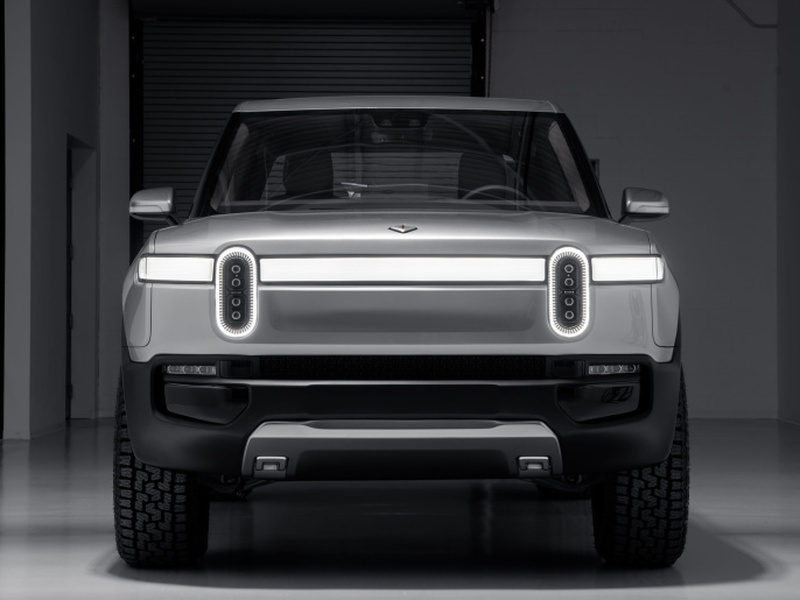 Rivian has clearly done their homework. Now, Telsa has some catching up to do. Interested in Pickup Trucks? Here are some of the best Light Duty Trucks this year.